Last week I shared with you the first two stages in my quest to lighten up a drab little corner of my dining room. As you may recall, the first thing I did was paint the lamp a creamy shade of white. Then I painted the little buffet Cafe Blue by Valspar. After that, all my little corner needed were some accessories. I decided to accessorize specifically for Spring. I love the lighter colors! I wanted to add some cherry blossoms. Of course, since we're still under about 8" of snow, we didn't have any yet (even though we have a cherry tree in our backyard.) So I used a couple of faux branches - available at Tai Pan Wholesale - which I placed in my pretty vintage canning jar. I decided not to tweak the lamp (yet anyway) but I switched it to the other side of the table which sets off the lampshade a little more. 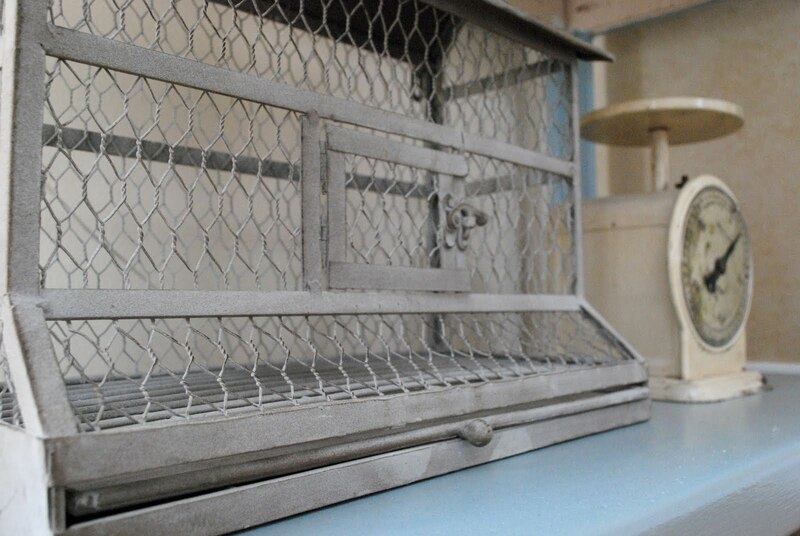 To the bottom shelf I added a darling chicken wire birdcage and my vintage scale. Then I finished the whole thing off with some pretty plates. 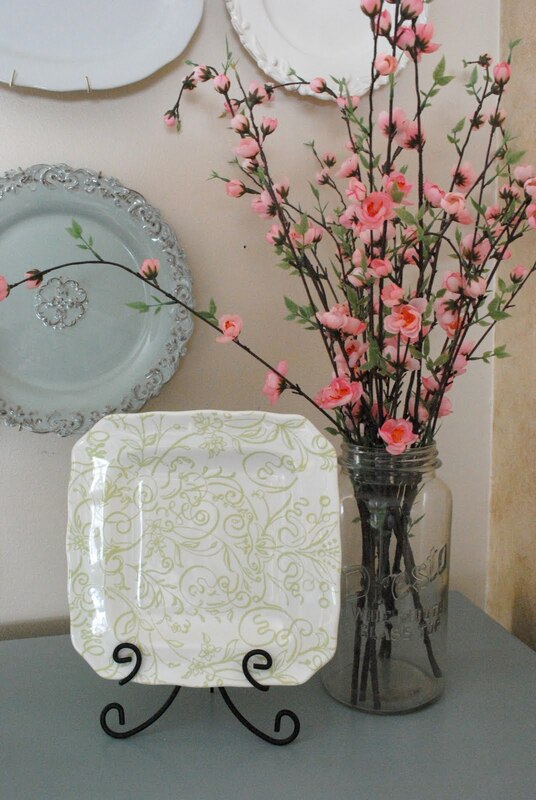 A plate collage above the buffet on the wall, and a pretty square plate with a spring green motif sitting on the table top. The whole thing is bright and spring-y and makes me happy to see. I decided that I will most likely switch things off for the seasons...I already have ideas brewing for a different set of plates for the summer. Afterall, I do suffer from Design ADD. But for now, I love how I brightened up this little corner. It's really beautiful. The lighter look is so relaxing and peaceful. Love the little touches. It looks so so great! I love the soft colors and especially the plates! I had to do a double take! That was awesome! Beautiful! I would have been afraid to do the blue- but I adore it. It looks so pretty! I love everything about it! Great job! It looks fantadtic all lightened up! 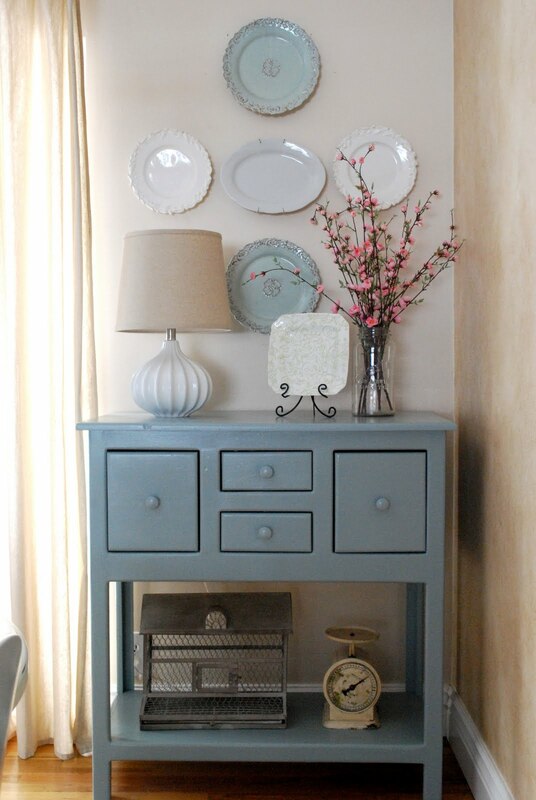 I adore those blueish plates on the wall! Beautiful but I do miss the chalkboard a tiny bit - hopefully you can find another great place to use it. I have those same blue plates from TJ Maxx and was just thinking of hanging them in my kitchen. 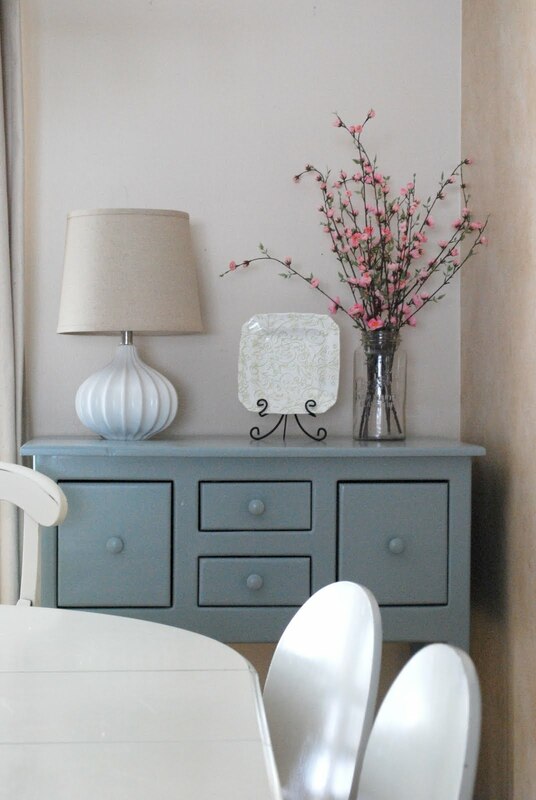 :) Love the color of your table and how it is so light and airy looking! It turned out great! I especially like the cherry blossoms- nice touch! just beautiful..so calming :) what a big difference from new paint and new accessories--LOVE IT! LOVE the color. And I love the dishes on the wall. Just a wonderful job. It just screams Springtime and fresh air. Great vision you had! LOVE the transformation. You did a wonderful job! Good job! It looks great! Love the color. Did your already have the plates or just match them up? I can't believe it made such a difference! It looks great! Beautiful! what a huge difference. I really like it! Beautiful! I love the blue and the cherry blossoms make me crave Spring! Such a change! I LOVE it!! It looks absolutely beautiful! That color of blue is hauntingly cute. ps...I love that you didn't tweak the lamp. I think it looks absolutely perfect! I really like the light colors -- did you have to change anything else in the room to balance the lack of black, or had that pretty much stood on its own? 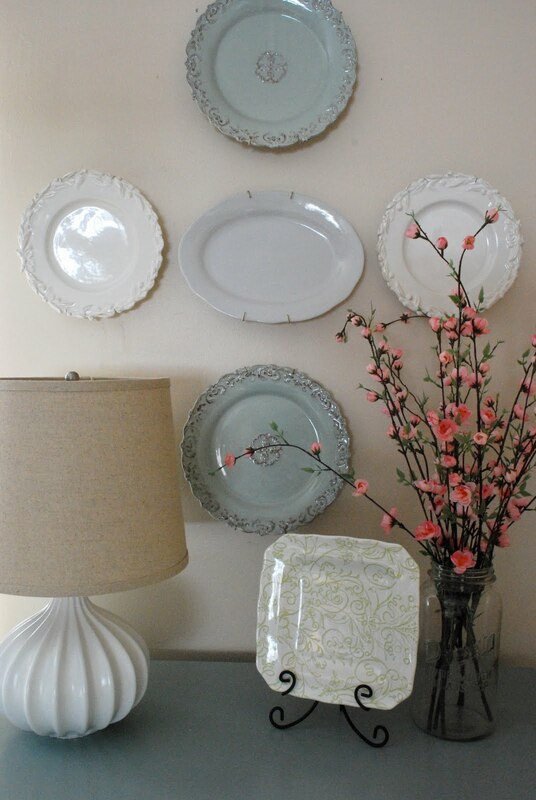 I adore plates on a wall and these look fantastic. I am in love with that blue color! What a difference it makes! And it looks all so springy! I especially LOVE the faux cherry blossoms. I think I'm going to have to go pick some up for my home! LOVE THEM! Wow - that looks brilliant! I LOVE the colors and the accent of the pink flowers. Nice work. Lovely! So fresh and Spring-y! A look I'm yearning for right now both inside and out! Wow! Amazing transformation and it looked beautiful to begin with! I love the color scheme that you went with....so calming. Looks great! Gotta LOVE Tai Pan! I so ♥ that "cafe blue" table! Having that blue stoneware amongst your plates makes it just, well, *m-wah* PERFECT! Amazing! I don't think it looked bad in the before pic, but LOVE the after pic!! It looks just beautiful Wendy! I've gotta get me some of those cherry blossoms. Love them! It looks beautiful now! I love it, so fresh and springy! And I know we're all so looking forward to spring but I can also picture this all decked out for fall too. I think the before looked great, but the after - WOW! I love the color scheme. So bright and fresh. Nice work! Such a fresh, light look for Spring! I am ready for Spring to come too!!!! Looks great!! I just love your plates..
Wow it looks great! So bright and fresh. I love the pink flowers and your 'new' lamp looks perfect on the table. Simply love the transformation. The colors are so soothing to the eye. Great job! Ah! I LOVE that chicken wire birdcage. Where did you get it? Is it old? 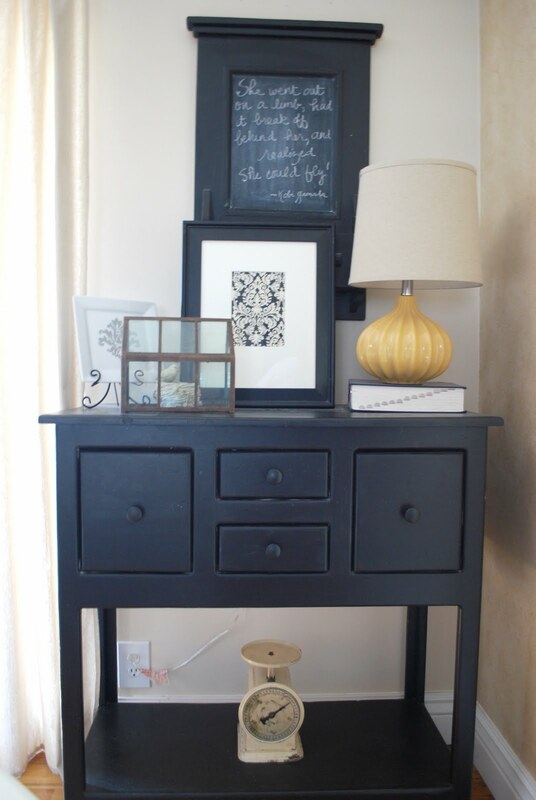 While I'm a huge fan of black painted furniture (have my own little antique table in the living room) I just LOVE what you have done. So soft, pretty and va-va-voom for spring. Love the pop of pink in the cherry blossoms. This is really beautiful!! I adore this color palette! It is gorgeous! The blue is so beautiful! Wow! Such a beautiful fresh look. Love it all. wow love your style, it works so well together. the plates are my favourite. beautiful blog, pleased to have met you. What a difference!! How pretty. I love the plates on the wall. Wendy, this is soooo beautiful! I love the color palette and the simplicity of it. True shabby nest style. LOVE! OMG I love love LOVE your blog. So many great ideas and projects tucked into one fantastic little spot. Kudos to you---keep up the great work! Any idea where you got the bird cage? I've found a much larger one similar to it and i'm dying to know who makes them! I would love to have it to put my bird in!